Actually, in this case, it was a movie and dinner. In that order. We decided we wanted to go see the new Hugo movie. Given all the constraints we had that day and for the rest of that weekend, we struggled to find a movie time that didn't impact other things. Finally, we settled on a time that ran into dinner time. That would really squeeze us trying to fix a dinner and force us to eat late. Not desirable. The solution: go out to dinner. Ah, here we go again. Where can we go that everyone else likes and I can find something safe for me to eat? This time it was easy. Both options on the table have gluten-free menus! Hurray! And we had just eaten at one of these a few weeks before, so the choice was really made for us. After the movie, we were going to eat at Uno's Chicago Grill. Uno's Chicago Grill is pretty much a pizza and burger joint. Once upon a time, my husband had a burger at Uno's and declared it to be a really good burger. This is high praise coming from him, so when he said he wanted to go to Uno's I figured he wanted a burger. But not this time. This time, everyone got a pizza. Everyone except me. But not for the usual reason! Now what's really sad about this particular story is that I could have had a pizza with them. Uno's offers gluten-free pizza! I was tempted by that gluten-free pizza. I really was. But we had just come out of the movie and I had consumed a bit more candy than I should have. I sort of wanted pizza, mostly because I could have pizza, but my stomach was telling me to think twice. I chose a salad instead. It is sad to choose a salad when you have the option of gluten-free pizza right in front of you. But the salad was the right choice that night. I'm glad that I ordered it. Uno's gluten-free pizza. I've had it before and it is good. I don't quite remember it as great, but good. I'm sure I'll have another chance to try it again. 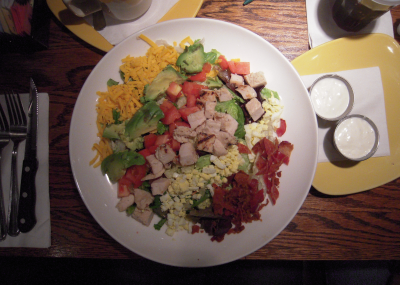 This time it was all about a gluten-free Cobb Salad. And it was good. What you can't see from the picture is how deep that bowl was. I know, it looks like a plate, but it was a bowl with a wide rim. This was a nice, large, fresh salad. Even the avocado was fresh and not bruised. It was all good. If you have an Uno's nearby, give their gluten-free menu a try. It's great to have gluten-free options in a pizza and burger joint!